Little girl explorers will love to rock for hours through the lush jungles of their imagination. Bella’s big soft ears crinkle and her trunk squeeks. She’s made of luxurious materials with a soft blanket seat, including two embroidered dragonflies which fly together to create a sweet heart. 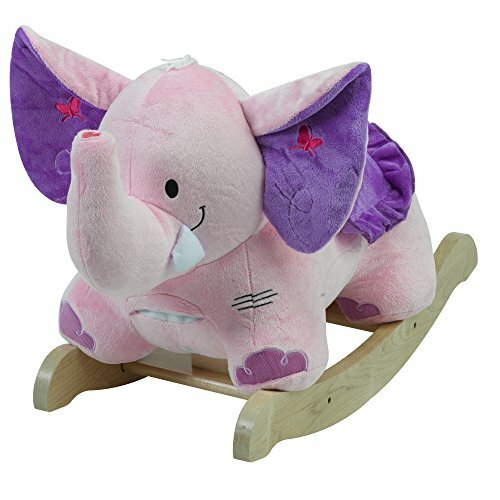 Its heirloom quality, fun-filled activites (like a squeeker in her trunk and crinkle in her ears) and original music will delight your little elephant rider. The four original songs are operated by pushing the colored shapes. These great songs also teach ABC’s, 123’s, colors, shapes and more.